So, Do you want to download and install Nokia 8 Pro Camera Mode on your Android device? 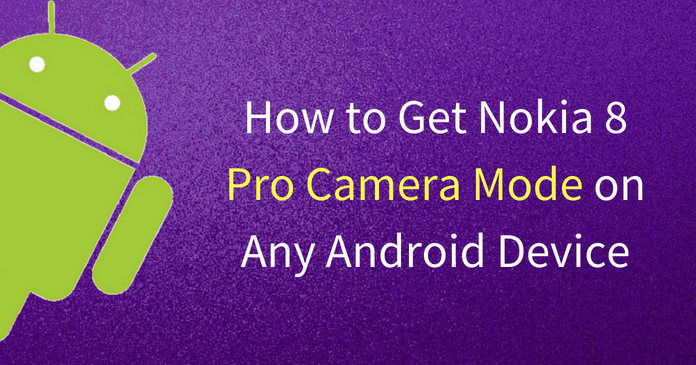 Then, Here I have the guide that lets you install and use Pro Camera Mode without any Root access. Recently, Nokia has released the new camera update to the Nokia 8 users. The new Camera application lets the users access Pro Camera Mode. So, This feature is not only for them, If you follow this guide you too can use that application on your Android phone. Before moving to the installation part, You need some Pre-requirements on your Android Smartphone. ⇒ You have to check whether your Android device is compatible with Level 3 API. To do so, You have to install Camera2 API Probe application from the Google Play store and Check the compatibility of your Hardware. If your Android device is Compatible with Level 3 API, then you can follow the steps given below. Before installing the Camera application, Make sure that you have enabled Unknown sources on your Android device. If not, Head over to the Settings >> Security >> Enable Unknown sources and come back to the guide. Now, Download the Nokia 8 Camera App from here. After downloading the file, Install the application like a regular app. Once done, You’re ready to use Nokia 8 Pro Camera Mode on your Android device. I Hope this guide helped to get Nokia 8 Pro Camera Mode on your Android device. If you face any problems with the installation, then please do let me know in the comment section below. I will help you as soon as possible. Also, Please do share this article with your friends and relatives.